My favorite wildlife photos tend to be shots where there is direct eye contact with the animal. There's an instant connection when you make eye contact with another living creature. It's one of the key ways we understanding each other and convey emotions - important elements in a powerful photo, the kind that makes you go 'wow'. Master wildlife photographer Frans Lanting calls this intimate style of photography 'eye-to-eye'. Getting eye-to-eye shots requires a mix of patience and knowledge of the species. On a physical level, you need to be roughly at the same height as what you're shooting. For a salamander, you may have to lay on your belly on a wet forest floor. For a soaring hawk, you might be high up on a cliff where thermals provide lift for the birds. Many photographers get caught in the trap of always shooting from the same perspective - standing with their camera at eye level on the tripod. That works for a bird perched up on a branch, or a standing deer, but there are many species where it doesn't fit. To be eye-to-eye, you often have to get dirty and sacrifice your own comfort. Stretching regularly makes this much easier on your body! A slow and fluid approach is key to getting within range of animals, to make eye-to-eye photos. Most species are instinctively programmed to flee when they perceive a threat, and fast or jerky movements suggest a predatory attack. Move smoothly and continually watch how the animal reacts to you. This is one of the hardest things to master - probably because it's so easy to get caught up in the excitement of the moment. I blow many good photo opportunities by getting overzealous! Beyond the physical challenge of getting close and level with wildlife, is a more subtle aspect of making eye-to-eye photos - that of capturing behavior, emotion and mood of the species. When you've gained the trust of an animal, to be able to observe and photograph it at close range, everyday behaviors and actions can lead to spectacular photos that connect us emotionally with the animal. For me, the times I've spent eye-to-eye with wildlife have been the very best moments of my life, and the resulting photos my most proud accomplishments. 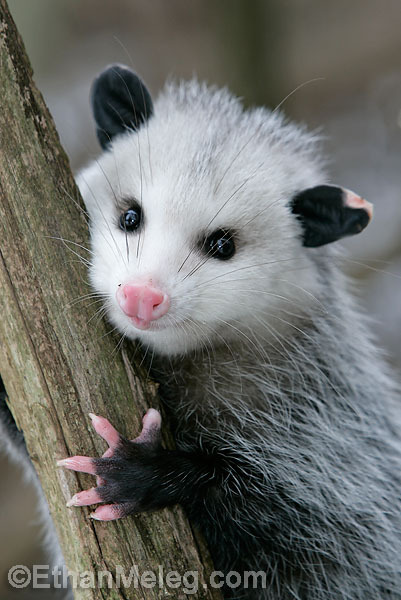 I found this young opossum clinging to a low branch in cold, wet weather. I photographed it only briefly because it was scared of me, and vulnerable due to the weather conditions. 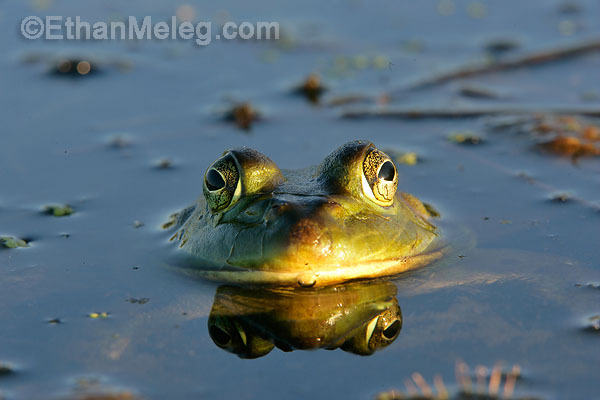 I waded in a swamp wearing hip waders to get eye-to-eye with this bullfrog. My camera (on a tripod) was only an inch or two above the water surface.